If you go back to 1997, Bill Clinton was President, Al Gore his V.P., and the Dow hit record highs when it topped 8,200. At the supermarket, a dozen eggs were approximately $1.17, a pound of bananas (maybe three) was $.50, and, for $4.59, you could have seen the top grossing movie, Titanic. Yesterday the Dow was at 25,064.36 and those dozen eggs went up to approximately $1.80. As for the bananas, at $.58 a pound, they are still pretty cheap. Today, let’s see where those price changes take us. When we look at what went up and down during the past twenty years, is there a message? 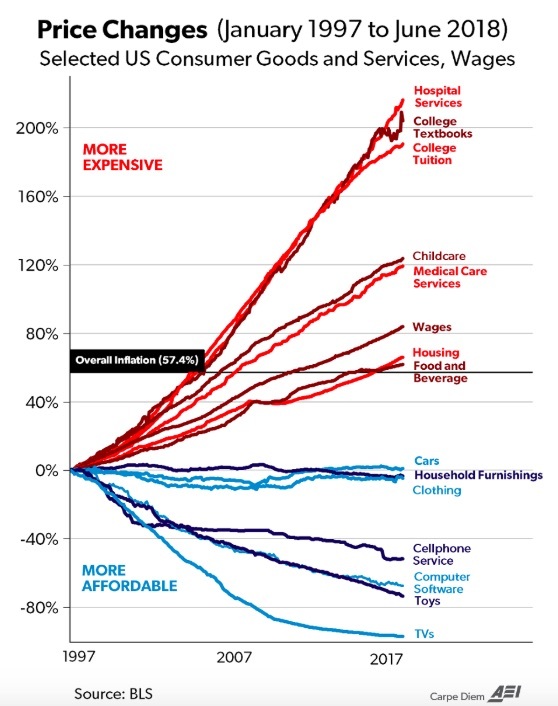 While average prices have gone up slightly more than 57% during the past twenty years, certain categories of goods and services are cheaper. Dropping the most, TV prices were down a whopping 97%. Somewhat similarly, typical toys cost us 74% less and software was down 67%. 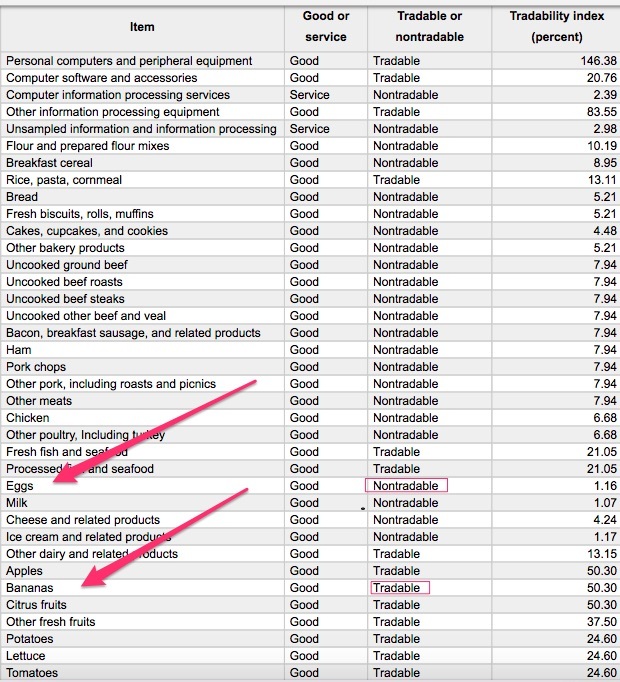 The common denominator among most of the items with price declines is trade. Starting with a definition, let’s just say that a tradable good or service is sold away from its home country. Correspondingly, our nontradables remain where they were made. So, where does this leave us? Knowing that a tariff is a part of the price for many tradables, our graphs could change soon. My sources and more: Thanks to economist Mark Perry for providing the perfect focus for today with his “chart of the century.” Then, for prices, I went to these BLS series for specific items. 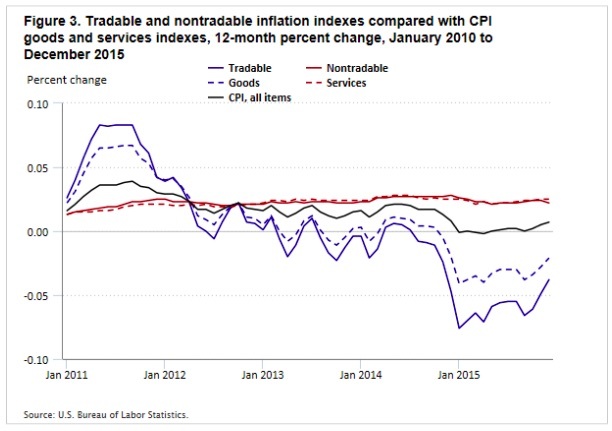 However, I really started to smile after discovering this BLS paper with an inflation index for tradable and non-tradable goods and services. Please note that the authors of the BLS paper expressed concerned that their time frame was just six years. They suggest further research in a number of areas.